For many young people looking to escape everyday life at home and the typically grey weather of the UK, a work placement abroad offers an ideal mix of valuable experience and exciting adventure. Leading travel dating website and app, TourBar.com, is encouraging all young travellers to ditch the sofa this study break as it is not too late to make the most of a solo work placement or internship abroad this summer. For those who feel anxious at the prospect of travelling alone, TourBar.com allows solo travellers over 18 years old to meet with others who are also interested in a productive work placement abroad. By using TourBar’s website and app, its 30,000 UK members can sign up for free and register an upcoming solo trip to similar solo travellers who are also planning to travel to a new destination to enrol in an internship or work placement. Alternatively, for those members who aren’t planning to work abroad any time soon but are still interested in meeting like-minded travellers, they can register as a Guide to tour interns and placement workers in their home city. When it comes to those travelling solo for a work placement, new figures released by TourBar share that 17.4%% of UK solo travellers have named the USA as their top destination for a solo work placement abroad. Following the USA’s lead, 14.6%% of UK members named Spain as their preferred work placement destination with other popular locations including Australia (9.3%%), Italy (8.3%%) and France (5.9%%). 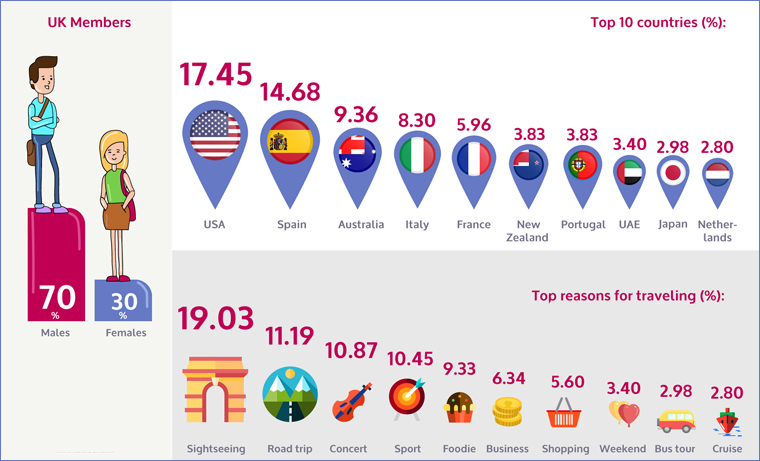 An equal balance of work and play appears to be a top priority for TourBar members, since 19%% of UK members plan to do some sightseeing during their employment. Other popular activities whilst undertaking a work placement abroad include taking a road trip (11.1%%), attending a concert (10.8%%) or watching a sporting event (10.4%%). Meeting likeminded solo travellers has proven highly popular in 2016, as the number of people aged 18-24 years old in the UK signing to TourBar has risen by 100%% in the past 12 months.